Gastrolobium celsianum (syn. Brachysema lanceolatum) is the Swan River Pea, a small spreading evergreen shrub to around 1 – 1.5m. Useful as a background plant or low informal hedge in native gardens. 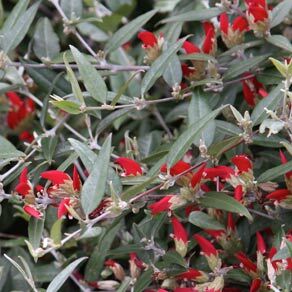 Attractive red flowers from winter to spring on a plant that copes well with a variety of soil and climate conditions as long as the soil is well drained. Widely used in native themed gardens where it will attract birds and insects. Used both as a ground cover plant as well as a low hedge in full sun to good dappled shade. Good rock garden plant. Very easy care and low maintenance once established make it suited to planting in commercial projects.